BGR FAB: Beginners Fab Ep 19 Wild Twist with the Daihatsu Project. 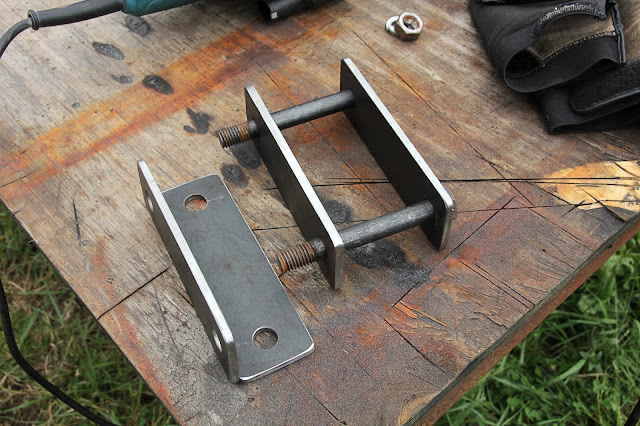 This site is all about DIY Metal Fabrication. I do what I can to share the knowledge that I'm gaining, have gained, and will gain. I don't know everything. I know that much. So, I will also share things that I find from experts, and that I think will inspire you as a DIY fabricator. Beginners Fab Ep 19 Wild Twist with the Daihatsu Project. As many of you may know, my Daihatsu Fourtrak/Rugger/F73/Rocky, is actually the vehicle that started the concept of Beginners Fab Tv (www.Beginnersfab.com). You also may have come to know that I don't claim to be an expert fabricator. However, I am an enthusiast. Therefore, I am determined to become more profecient in my fabrication skills, and at the same time, make my rigs better also. Since I began Beginners Fab, I have been re-moding my Daihatsu based on the original modifications that I had added a while back. Unfortunately, here in Chile, it is hard to find a mid level mig, and therefore, you pay top dollar for a good mig machine. Think one of the U.S. market expert/professional migs, but at twice the cost. So, that was out of my range. My only option then, was to go with a stick welder. This welder would be affordable, have the amps to weld axles, and be able to handle up to around .5" stock without to much hassle. The only problem was... I didn't know how to stick weld. Unfortunately for me, my stick welding experience started while my suspension was already cut off the Daihatsu. So, with some practice, and a WHOLE bunch of nerve, I welded on my first full custom suspension. Honestly, the majority of the suspension held up well. My biggest issue, was that my upper link on my 3 link ripped loose from the Factory chassis cross member. I knew then, it was time for a better design. Still, my mind set was to just get the rig going and sale it. Things changed with time though. After having spent a number of weeks working on the suspension re-design and re-working a number of components, I finally got fed up enough with the hideous work that I had done, and my lack of confidense in my past work, that I decided it was time for a change! This episode explains the Wild Change that is taking place! So, I hope you enjoy the episode! If you want to learn how to do some basic to moderate fabrication with simple tools, please check out my Beginners Fab TV show and home page at www.beginnersfab.com. 15 Minutes With A Pro: Max Gremillion from Pull Pal on Must Have Tools For Beginners/Budget Fabricators.